Easily Prepare Yourself for the CPA Exam! Steve G. Jones, Ed.D., Clinical Hypnotherapist, charges $1,500 for a custom recording and $25,000 for a one-hour private hypnotherapy session at his office. But you can get all the benefits for this low price. Simply listen to the Improve Study Habits for the CPA Exam Hypnosis MP3 every night as you go to bed for three weeks and feel the changes happening in your life. You will feel more empowered, more in touch with your true self, and you will truly know that your goals are within your reach. Steve G. Jones achieves AMAZING and LASTING results!!! Hypnosis is the easiest way to affect change in your life because the positive messages in the Improve Study Habits for the CPA Exam Hypnosis MP3 session go straight to your subconscious mind effortlessly so you can accomplish your goals and reach for the stars!! 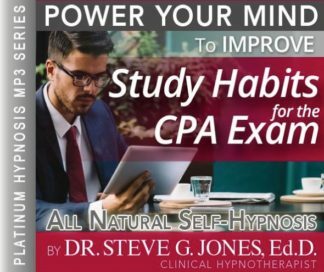 All you have to do is listen to the Improve Study Habits for the CPA Exam Hypnosis MP3 audio at night as you go to sleep!!! You’ll hear soft music, the gentle sounds of the beach, and the soothing sound of Steve G. Jones’ voice all working together to bring about positive changes in your life easily and naturally. Steve G. Jones has been helping people improve their lives with hypnosis for over 17 years…now it’s time for him to help YOU… don’t wait, do it NOW !!! you’ll be glad you did. See you at the top! You feel stress being left behind as if it is dropping off your body, that’s right. You learn to easily manage stress. Feel the stress being left far behind as you relax. And any time that you think about your CPA exam or are studying for the exam, you realize you can leave stress far behind. Because any time you feel stress in your life, you stop, take a deep breath in, you hold it and you exhale slowly and then you count to ten and as you do you feel yourself managing the stress in your life. You focus on the positive and you are committed to keeping positive habits even in times of stress. You limit the amount of sweets you eat. You allow yourself one serving a day. You are able to focus on studying, easily and effortlessly. You have healthy habits in times of stress because you are easily able to manage stress. Imagine yourself studying, preparing for your CPA exam, that’s right. Imagine yourself studying, that’s right. And see how focused you are. The information goes into your mind easily and effortlessly, it just flows into your mind easily. You realize just how easy it is for you to study and you quickly learn the material you are studying. You are a very focused person. You are able to concentrate easily while preparing for your CPA exam. When you begin a study session, you are able to focus and concentrate easily. You are able to focus and concentrate easily. You are a very focused person and you are relaxed, you are calm, you are peaceful. You are easily able to focus on studying. You are able to block out other things and just focus on studying. Focus on your goal, your goal of preparing and taking the CPA exam. Focus on that goal. You are able to focus on anything you want to focus on. Day by day your powers of concentration and focus are increasing more and more. You are becoming very focused on studying and preparing for your exam. You are able to concentrate on all of the information you need to learn for your CPA exam. Imagine yourself there in the moment, focused, relaxed, concentrating, blocking out any unnecessary situations, blocking out any unnecessary ideas, just focusing and concentrating on preparing for your exam, that’s right. Imagine yourself, so very focused, that’s right. See yourself, see how calm you are and relaxed, how determined, that’s right. And this is how you will be from now on when you choose to focus. You simply say the word ‘focused’ and immediately you are focused entirely. Focused on studying and reading your accounting material.